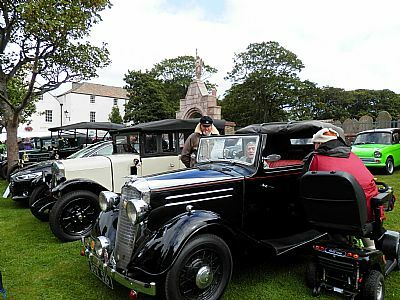 This year we filled Broad Street with tractors, stationary engines, motor bikes and cars. We were joined by Orkney Food and Drink Group who had stalls with a big variety of local food. Jonathan Porterfield from Eco-Cars Ltd brought along a selection of electric vehicles including the exotic, very expensive and very fast Tesla Model S. He took some lucky people for a test run and they were very impressed by the massive acceleration of this beast. The Willowburn Valley Stompers played some great jazz numbers. From the very modern we go back to the oldest exhibit, a 1 ½ HP Petter Standard Oil Engine made in 1900, restored and exhibited by Angus Harcus. He also provided the oldest car, a 1915 Model T Ford. As a contrast this was flanked by a new Ford Mondao from WR Tullock Ltd.
Alan Scott brought his latest acquisition, a 1944 Case DX tractor in remarkable original condition. There were 9 tractors in all filing one side of the street. The last in the line was Stephen Metcalf’s Ferguson T20 with a transport box and milk cans, just as they were used on small farms in the 1950’s. The biggest tractor was undoubtedly Bill Gray’s Ford 8210 which made towing the big old Allan oil engine look very easy. We took the opportunity to hand over cheques for £1000 to both Clan and Dial-a-Bus. Click below for photos which give a flavour of the afternoon which was enjoyed by a large crowd of spectators.